Parking in Boston can be tricky. 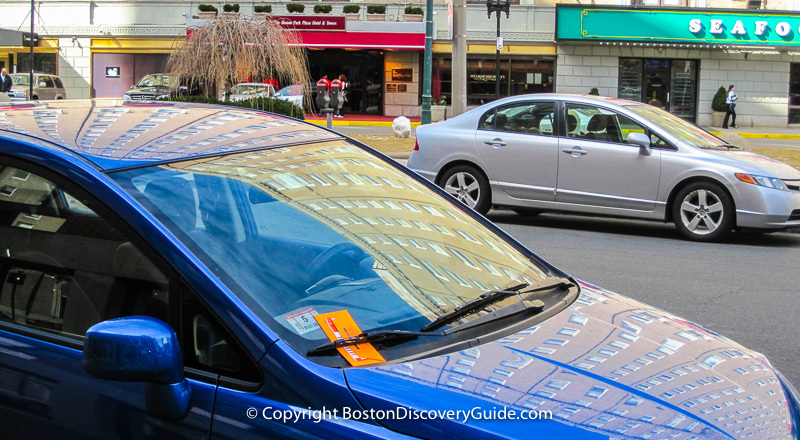 If you're visiting Boston and trying not to get lost while navigating the twists and turns of narrow streets laid out during Colonial times, you'll soon find out that finding cheap parking will be even more challenging. Up to half the traffic in some parts of the city consists of cars circling around while trying to find curb-side parking zoom - but even if you feel tempted to join the competition, don't waste your time and gas. Boston routinely ranks at or near the top of "most congested cities in the U.S." lists, and driving around the block can take much longer than you might expect. The best place to park in Boston is in a garage. On-street metered parking in Boston is quite limited in most areas and virtually non-existent in others. You'll see mostly "Resident Only" spaces. And if you make a parking mistake such as parking in a tow zone or your parking meter runs out of time before you return to your car or you park in a Residents Only space without a sticker (easy to do in areas such as parts of Back Bay where metered parking morphs into Residents Only after 6pm), Boston parking ticket fines can be expensive - from $25 to as much as $120 for some offenses. That hurts. But still, even $4/hour to park is dirt-cheap - so parking at one of Boston's 9,000 metered spaces, if you can find one, can be tempting. But parking at a meter can lead to serious pain . . . the kind that's produced by parting with lots of money. Unfortunately, our Boston parking police are the fastest on the planet at issuing tickets, especially in neighborhoods such as Beacon Hill, Back Bay, and the North End. They know which meters are about to expire, and watch them like hawks. Return to your car just one second too late, and you'll find a fluorescent orange ticket on your windshield. Trust us, they're ugly. Furthermore, many areas limit the total amount of time you can stay in one spot within a certain area, even if you successfully race back and add more quarters before the red Expired! sign flashes. You can be ticketed for exceeding the time limit for parking on a particular block, even if you move from one spot to another. The only days when you don't have to put money in the meter for on-street parking are Sundays and City of Boston holidays - which, in case you're wondering, include all the usual federal and state holidays plus Evacuation Day (March 17, which of course also happens to be St Patrick's Day), Patriots Day, and Bunker Hill Day. What's important to note about free parking on holidays is that on-street parking is free on the actual holiday, not the day when it happens to be celebrated. For example, if New Year's Day (January 1) falls on Sunday but offices close on Monday (January 2) to celebrate it, on-street parking in Boston is free on Sunday (which is free anyway), not Monday. Make sense? Of course, occasionally the Mayor declares free parking. Good luck trying to find a metered space on those days! If you're visiting Boston, you probably want to focus on enjoying our attractions and events, not worrying about exceeding your time at a parking meter. Plus, it can be tough to know which blocks don't allow extended parking and which days are free. And paying a parking ticket can certainly spoil a vacation fast. During winter months when ice and slush makes streets slippery and driving treacherous, parking on the street can be hazardous for your car. So you can see why parking garages quickly become your best choice. Although Boston parking garages charge hefty rates, they're cheaper than parking fines or repairing scraped fenders - if you avoid the most expensive options, and know where to find discounts and specials. Boston Common Garage - Convenient and affordable parking in the center of the city - perfect for Beacon Hill, the Theatre District/Downtown Crossing/Chinatown, Back Bay, and Freedom Trail sites such as Faneuil Hall. If you don't mind a 10-minute walk, you can also reach the North End and even TD Garden fairly easily from here. If you do mind the walk, just hop on the T (Boston's subway) at Park Station on the Common. And if your destination is Boston Common (for Shakespeare on the Common, for example), the Public Garden (Make Way for Ducklings statues and Swan Boats), or the Esplanade (July 4th Boston Pops concert and fireworks, other summer concerts), no other parking garage is closer. Bonus: rates are significantly lower than other nearby options, and the garage is easy to enter and exit from Charles Street. Parking Garages near North End Attractions and TD Garden - Best garages and lots near TD Garden, Faneuil Hall, local Boston Harbor cruise departures, Government Center, Haymarket (including my favorite - the cheapest parking garage in Boston, with validation), the Greenway, and of course, the North End. Boston parking garages near Theatre District attractions - Convenient and least expensive parking garages near Boston's Theatre District and Chinatown, as well as Bay Village, Beacon Hill, Boston Common, and Public Garden. Our #1 tip? If at all possible, leave your car at home, and take the T or the Commuter Rail train. Or even a shared ride service such as Uber or Lyft. But if you absolutely can't, we hope these recommendations for the best places to find affordable parking in Boston will help you avoid parking tickets!